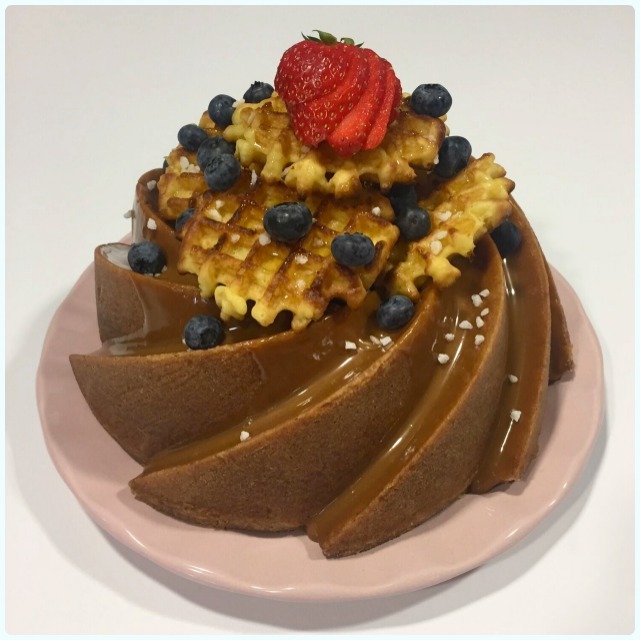 It's a bundt cake, but it actually tastes like a caramelised, toasted waffle. If that wasn't enough, it's then topped with more waffles. Waffles, waffles everywhere. Wafflesville, Waffle County. I was walking round Sainsbury's when this idea hit. I bloody love a good waffle. I was buying some boring chicken before a particularly heinous gym session, and I was craving them more than anything on Earth. And there she blows. Never one for a boring bundt, I was dreaming of stacking it sky high, drowning it in caramel then drizzling with more syrup. It was happening. I feel I need to warn you though, this is not for the faint hearted, and only serious sugar eaters need apply. This has to hold one of the quickest 'desk to demolished' times we have so far. This one was snaffled pretty quickly, perhaps on a par with the Salted Caramel and Peanut, and Malted Milk creations. Quite a few of you asked for this recipe ASAP, so please accept my apologies for the delay, but expect a flurry of bundt recipes over the next few weeks as I catch up! Whizz up 2 of your waffls in a food processor, until they are large crumbs. Tear the others into 1cm squares - ish. Stir the obliterated waffles into the cake mix with the golden syrup. When the cake is fully cool, warm the caramel in the microwave until it's a runny texture, then tip over the cake in a fanciful fashion. Decorate with more toasted waffles, a drizzle of golden syrup, berries and sugar pearls. Understated, you know.